To get the most benefit from DDD, you need to understand the strategic practices for discovering what is core to the business vision and creating organisational and technical designs aligned to solve the key challenges. 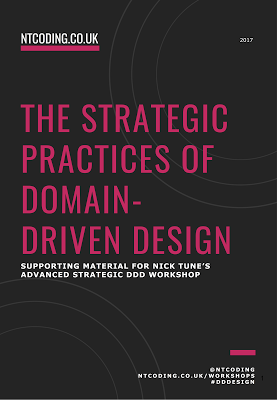 You can learn about the strategic aspects of Domain-Driven Design in my The Strategic Practices of Domain-Driven Design booklet. This booklet is used as the supporting material for my advanced Domain-Driven Design workshops. However, it can also be used in isolation, especially if you want a guide for getting started with strategic DDD. You are free to use the booklet however you please. You can use it to run workshops in your organisation, as bedtime reading, to help your teammates think beyond the tactical side of DDD, etc. You are even free to edit the document however you wish. Absolutely no restrictions. Please share with me any questions, suggestions, or feedback you have, though, especially if you edit the document. My goal is to make it as useful as possible for people who really wish to get the true benefits of DDD.